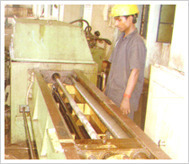 DHJ Engineering Technology Pvt. Ltd. Being a well-known service provider, we hold proficiency in undertaking Power Plant Fabrication Service. We use latest technology and superior quality material to offer these Power Plant Fabrication Service. Our team of professionals further keeps a check on the clients' requirements and makes sure to fulfill the same by providing Power Plant Fabrication Service. With years of experience and knowledge in this domain, we are engaged in offering cost-effective Solar Power Plant Fabrication. Rendered as per the exact detail provided by the clients, this service completed within the set time frame. Our skilled professionals are capable of managing and accomplishing projects with accuracy. - Fabrication & Erection of pipe racks & other Auxiliary structures for petrochemical refineries, chemical refineries & chemical plants. - Fabrication, Erection & Launching of steel. By comprehension the arrangements of regarded benefactors, we are occupied with rendering Power Plant Fabrication Works. These administrations are performed underneath the outrageous direction of educated experts by utilization of cutting edge apparatuses and innovation. So as to furnish the dynamic and rising requirements of our customers, we are rendering Power Plant Fabrication Works to our clients. Due to their minimum maintenance, flawlessness and reliability, these offered fabrication services are widely valued and respected amongst our customers. Nagpur Engineering & Structural Co. Pvt. Ltd.